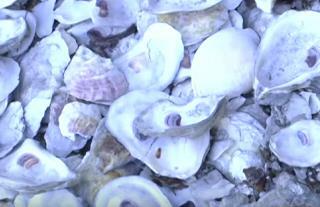 (Newser) – "They were eating oysters like crazy," an archaeologist says of Native Americans who visited what is now the coast of Maine for thousands of years. And it's a good thing they did. The piles of discarded oyster shells created by hungry Native Americans over centuries are an irreplaceable source of information on their cultural practices, as well as the environment and climate of Maine millennia ago. "If you want to know what was in the western Gulf of Maine 3,000 years ago, this is how you're going to figure that out," Dr. Alice Kelley says. But the New York Times reports Maine's more than 2,000 shell piles, or middens, are disappearing thanks to climate change and rising oceans. "They are disappearing so fast, and the knowledge that is within those middens will be washed out to sea," says Donald Soctomah, historic preservation officer for two Passamaquoddy tribes. I'm concerned about 3 things. #1 if we lose the world's ice we won't have to go to Mars to see what a desert planet looks like. #2 Overpopulation mixed in with dwindling natural resources. #3 Balancing our budget !!! All 3 things are tied together if we want to be a world leader again and Make America Great. We need to lead by example. The best way to accomplish this is to close the border and hang a sign saying close for balancing the budget and taking inventory. We have a great tool called the Internet that is able to teach self sustainability. ---------------------------------------------- Here's the proof in the pudding !!! Has welfare produced responsible taxpaying citizens ??? We are on six generation of welfare dependence. Funny how a first-generation immigrant can come to this country and within 20 years are sending their children to college. 1/2 the states have unlimited baby popping in order to keep receiving welfare. Politicians refused to address the abortion issue because there after the Christian vote. So keep kicking the can down the road because were afraid of what other people think. I'm open to other suggestions and solutions !!! But honestly I don't see no other way out of this quagmire.